Aloo Bonda at the Vindalho Restaurant in Portland OR, originally uploaded by ShashiBellamkonda. 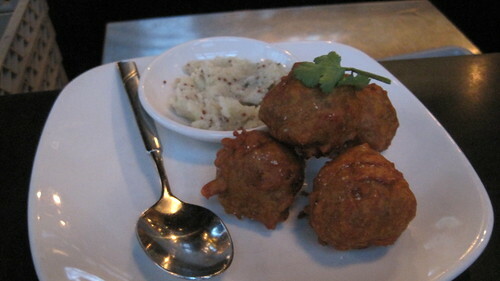 I ate the 2nd best Aloo Bonda in the United States at the Vindalho Restaurant in Portland . Now there is a difference the best I have eaten are at the Bombay Bistro Rockville ( 98 W Montgomery Ave Rockville MD 20850) yet the Aloo Bonda at the Vidalho seemed like a south Indian speciality converted into an all American food. Vindalho calls thier food "Spice Route Cuisine - modern interpretations of heirloom recipes from the Indian subcontinent"
I would give them high marks for achieving this. Chutneys were great and I ate the Chicken Seek Kabab and the flavor of garam masala was great - I did not relish the Tamarind mushroom and cream sauce that came with the Chicken Seekh kabab and enjoyed the mint chutney. Papads were awesome and so was the Haywards 8000 beer that is Indian and I have never tasted it in a long time and never in the US.